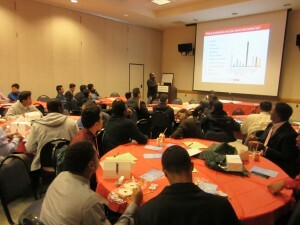 This past Friday, April 24, 2015, Raritan Valley Community College hosted over two hundred Black and Hispanic teenagers for the 7th Annual From Boys to Men Conference. The conference was organized and co-hosted by the New Brunswick Alumni Chapter of Kappa Alpha Psi Fraternity, Inc., a fraternity of college and professional African American men, who have a proud history of mentoring high school youths. Charles Brown MPA, of the New Jersey Bicycle and Pedestrian Resource Center, hosted a workshop called “Re-envisioning Your Street.” In it, he introduced the teens to urban planning, and informed them of how a career in planning could empower them to provide real, positive change in their community. Mr. Brown’s presentation began with an ice-breaking exercise in which the participants were asked to identify a city based off a picture of its skyline. The students were then asked if they were familiar with the urban planning profession; not surprisingly, most of the students had never heard of it. Mr. Brown then took the opportunity to explain the role of planners in creating these cities, and then introduced the different focus areas in which planners can specialize, such as land use, transportation, and housing. The participants were then shown a picture of a street in the Fairmount district of Newark, which was the subject of a Graduate Student Planning Studio at the Rutgers Bloustein School of Planning and Public Policy, taught by Mr. Brown. The teens were asked what made the street incomplete, and they offered suggestions on how to improve the area. Mr. Brown then transitioned to a photo rendering of what the street could look like with a Complete Streets improvement project, such as a better sidewalk, bicycle lanes, lights, and trees. He also talked about some of the principles of CPTED (Crime Prevention Through Environmental Design), demonstrating how urban design elements can be employed to reduce the prevalence of crime. 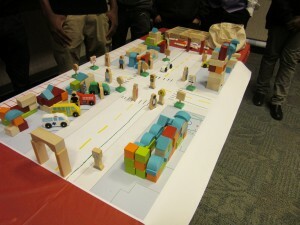 After showing a second example of a potential street transformation, Mr. Brown asked for volunteers to come to the front, where they were given blocks, model cars, and a large printed plan of a street. 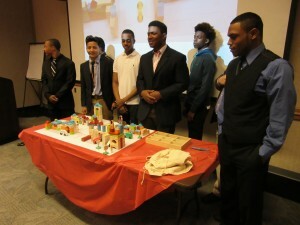 The teens were given time to create their model downtown. Working together, they “built” a safer roadway as well as civic amenities, such as a school, athletic fields, and a train station. While construction was underway on the model town, other students were asked to describe what changes they’d like to see in their community, and were given the opportunity to ask questions. Several of the teens in attendance took the initiative to schedule further communication with Mr. Brown to help plan out their futures. At the end of the workshop, the teens left with a better idea of what urban planners do, and how a career in planning could help them bring positive change to their communities. Posted on April 30, 2015 January 20, 2017 by njwalksnbikesPosted in Community Engagement, Complete StreetsTagged Charles Brown, from boys to men.